QuadraNet is pleased to announce the hire of Brian Flowers, CPA, who has joined the QuadraNet team as the company’s appointed Chief Financial Officer. QuadraNet is pleased to announce the hire of Brian Flowers, CPA, who has joined the QuadraNet team as the company’s appointed Chief Financial Officer. Within this capacity, Flowers will be responsible in managing and planning the company's finances, as well as aiding in critical business decisions through reporting and analysis. Flowers is a Certified Public Accountant with over twenty years of experience in both public and private accounting. His career began in public accounting with the big four firm, KPMG LLP, where he extensively served publicly traded high-tech and software clients, before pivoting towards the private technology sector in which assumed the role of Controller and CFO in various start-up and private equity backed technology companies. Mr. 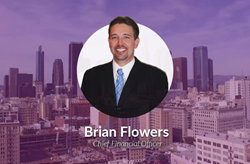 Flowers has extensive experience dealing with the financing and accounting needs of private companies and has been a key figure involved in the closing of multiple acquisitions as well as raising over $150 million in venture funding. Flowers has a Bachelor of Science in Accounting from Loyola Marymount University. QuadraNet is an IaaS (infrastructure-as-a-service) and colocation services provider with facilities in Los Angeles, California; Dallas, Texas; Miami, Florida; Atlanta, Georgia; Chicago, Illinois; and Secaucus, New Jersey. With a team of highly-skilled professionals that are passionate and excel at designing and implementing the perfect solution for clients and their businesses, QuadraNet has a chief focus on providing consistent and exceptional service and support. Facilities and services are staff and monitored 24×7 to assist with everything from routine memory upgrades to advanced systems troubleshooting. QuadraNet’s Los Angeles, California colocation sites include a 60,000-square-foot facility of privately-owned and operated data center space located in Downtown Los Angeles, and an 80,000-square-foot facility located near Los Angeles International Airport (LAX). For more information about QuadraNet, visit https://www.quadranet.com/.